Apparently I took a page out of my own book this weekend because we couldn't have packed more fun into this weekend. We were constantly on the go and had a big break in the hot temperatures (yesterday it got down to 65-70 degrees! ), so we were able to spend more time outside and not be completely exhausted after twenty minutes. We even slept with the windows open...July, what is going on? You're confusing me. Saturday: My girlfriend Angela and I went to breakfast at Knead (downtown) to cross another spot off our list. Unfortunately, I'm not going to spend much time discussing it because we were pretty disappointed with the experience. We loved that all their food is made from scratch and all local, but it was extremely overpriced, the service was poor, the food was just OK, and we didn't leave full. It was such a bummer! Saturday night we went to the Goat for multiple rounds of corn hole and to hang out with friends by the pool. The weather was cool and we loved every minute of it! Sunday: We spent the day at the Ohio State fair, which is what all the pictures above are from. Billy has never been and I don't remember the last time I've been so we decided to give it a go! There was SO much to do from rides, to craft shows, and most importantly-fried foods for us to conquer. Those fried balls up there? FRIED BUCKEYES. I'm not even lying when I say they were possibly the best things I have ever had. If you ever get a chance to have them, just go ahead and order 2 orders of them. Also, who knew that fairs have a sea lion exhibit? I guess the Ohio State fair does. They even put on a little show for us. I also decided that since we were at the fair it was perfectly acceptable to act like a kid again and go to the petting zoo... this is okay still at my age, right? I mean, I had to see the zebra! The fair is not somewhere I could go all the time (just no...), but we're happy we went at least went and experienced it for a couple hours. Sunday night was reserved for the best of all...Rocky snuggles. Go link up with Sami and share all about it! Your fair looks like so much more fun than ours! And you couldn't have asked for better weather! That picture of Rocky is too precious! I have that dress too and love it! Also, your dog is so flippin adorable!! I'm quite possibly in love with you dog! Too adorable! omg, I love your dog....so so cute! looks like such a fun weekend, I love hitting our local state fair once a year in the fall! Jealous of the 70 degree temps, it's been in the 90's in Eastern NC lately making outside events very hot and sticky. It was pretty cool here in PA as well, it's nice and refreshing change but definitely didn't seem like summer time this weekend! And now I'm sitting her begging Michael to find a fair and take me asap. He may not forgive you for this one. So happy you had a great weekend lady. Have an amazing week! ahhhhh the fair looks AWESOME!!! and the goat. oh. the goat...i miss it SO MUCH! ive never had a buckeye but now i really need a FRIED BUCKEYE!!!! chicago has been really nice too and night you need a sweatshirt! I love that the Ohio fair is outside! Our big farm fair in Pennsylvania is indoors in January - I'm thinking yours is a lot nicer than ours! Y'all did have a jam packed weekend! In my opinion, those are the best! We went to the State Fair this last year for the second time ever & it's so much fun! Not something I could do all of the time though! This looks perfect! I need to go to a FAIR soon! Zebras, sea lions, and fried buckeyes...Oh my! What a year for the fair! A little bummed I didn't get to visit the Ohio State Fair when I was there in college. Looks like a blast! Glad you had a fun filled packed weekend! Love fairs!! Well, mostly the fair food of course ;) Wish I could have been in Ohio at that time, I love Styx! Once of my favorite classic rock bands. Such a great weekend!! And heck yes to this weather we have been having! 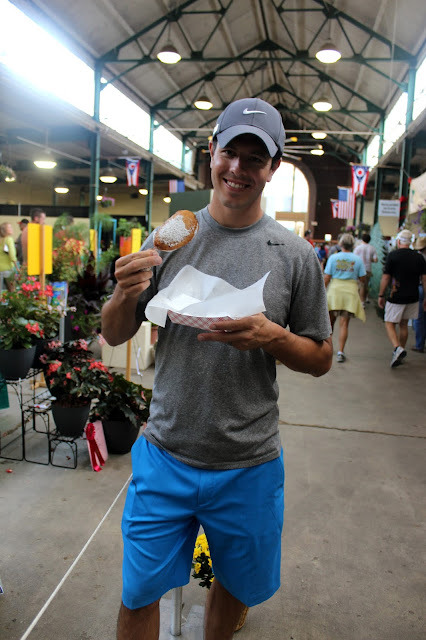 Can you believe I've never been to the Ohio State fair?! It's definitely on my list to go to some day. This looks like such a fun and yummy weekend! Glad you got to have so much fun! Mondays are always such a party killer! In high school we used to go to the concerts at the fair, lynyrd skynyrd whaaat? and it was always such a show. The people are hilarious to watch. Looks like a fun weekend! What on earth is a buckeye? wow what a great weekend!! i love love love Cards Against Humanity!! so fun!! I am OBSESSED with the fair!! The WI state fair is coming up next week and I'm so excited to go, but there definitely will not be any deep fried buckeyes :( Those look insanely delicious! I can't believe the fried buckeyes!! That is definitely worth trying out. And yes, I can't believe this weather! Not gonna lie, I only looked at the pictures -- but from what I can tell you had one hell of a weekend. First of all, "deep fried" stuff was involved. Second of all, you look awesome in that dress and necklace! Third of all, THERE WAS A CAMEL INVOLVED. You win the weekend girl. FRIED BUCKEYES. Gimme. I agree the Fair is like a once a year kinda deal but it is fun. Colorado's has lots of normal farm animals.. no zebras and camels. I'm jealous haha. I am officially ready for our state fair. Too bad we have to wait another 2 months to enjoy fried goodness! I cannot wait until the State Fair of Texas. It opens on September 27 and I've decided I would like to spend the last bit of my birthday month indulging in fried foods. I love the maxi and the necklace, gorgeous! What a fabulous weekend. I love state fairs. They are so fun. The animals are always my favorite but the fried food is pretty great too. I love that you have the "Goat" to go to. I wish we had something like that. It looks like so much fun. Oh my goodness could those seals be any cuter?! If there's one thing that trumped life in Chicago, it was the Wood County Fair. We always went back every summer to visit my aunts and uncles all in the BG/Toledo area and my aunt in C bus would drive up. Fair food is just one of those MUSTS of summer! That fair looks like heaven to me!! Wow!! Looks like a great weekend! That fair looks like so much fun! The Ohio fair looks like so much fun. That zebra looks pissed though, haha! I have been craving fried buckeyes since I saw your instagram of them! Geez those sounds delicious!! !